How can you be sure you have enough of the right expertise and technical ability on your team to meet your business goals? As a leader, you do your best to manage risk diligently in most business areas, but "people risks" are often held to a lower standard. The problem is real and growing, in part because you just don't know what to do about it. Whether leading a team, a department, a division, or a whole global company, managers and executives need a better way to think and talk about their critical talent needs. This isn't just about filling head count. You need to know what it costs in time and money to develop, replace, and/or align experts who have unique technical knowledge--and you also need to know what can go wrong in the meantime. Insufficient skills and bench strength threaten every organization's productivity, innovation, and competitive edge. How can your strategy succeed without the right people--the scientists, engineers, technicians, designers, analysts, and other experts--to execute it? If you're looking for confidence, clarity, and speed backed by data, you don't have to settle any more. ​Steve Trautman offers revolutionary yet practical ideas for every level of an organization (including the corporate board) so that you can manage talent risk with clear, measurable, and relevant data. 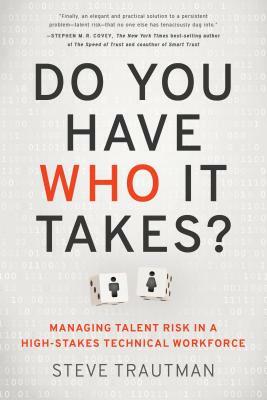 This book goes far beyond academic theory to include a talent risk methodology, scripts for critical conversations, case studies, and useful tools derived from boots-on-the ground experience. Steve Trautman is corporate America's leading talent risk management expert. He initially pioneered the field of technical knowledge transfer, developing the nationally-recognized gold standard used by blue-chip companies ranging from Aetna to Goodyear, Kroger to Zynga. Building on that foundation, Steve brought his practical, data-driven ideas to talent risk management, creating tools that are straightforward and relevant for even the most complex organizations. Steve and his team at The Steve Trautman Co. have been providing Fortune 500 executives with the simplest, quickest, and most practical solutions for managing their talent risk, especially in highly technical and professionally-skilled teams, for over 20 years. He is the author of Teach What You Know: A Practical Leader's Guide to Knowledge Transfer through Peer Mentoring and The Executive Guide to High Impact Talent Management. Steve speaks internationally and provides business leaders with common sense guidance and support.